Being a camp counsellor is an awesome job. It can be a hard, exhausting, emotionally and physically draining job – but man, it’s awesome! Camp counsellors are on duty 24 hours a day everyday while their campers are on site. They are expected to be patient, kind, understanding, fun, silly, full of energy, responsible, leaders, teachers, authority figures, role models, friends, confidants, and so much more – all at the same time. It’s a big job, and there are thousands of counsellors every summer who accomplish this and go above and beyond to give their campers an amazing summer. They are rock stars. It’s up to the camp director and the leadership staff to make sure that camp counsellors are able to be rock stars for their campers. Obviously orientation, risk management, and training are all hugely important parts of developing excellent staff, but motivation and encouragement are the focus for this series. Sometimes counsellors have a hard day (don’t we all?) they get tired, frustrated, sad, tired… (it’s worth saying twice) there are a million reasons why a counsellor might feel that way, being human is at the very top of the list. These reasons could be camp related or not, it’s hard for anyone to be “on” all the time. So it’s up to the camp’s leadership staff to recognize when a counsellor (or any member of the staff for that matter) is feeling low and give them some support. 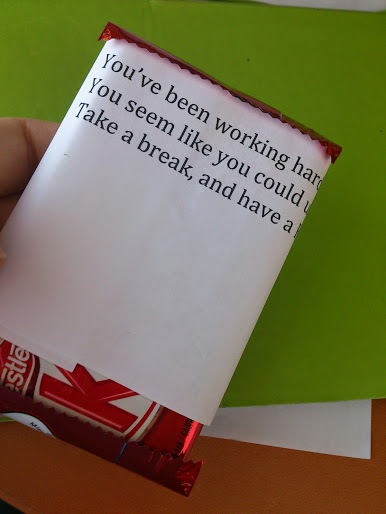 Here’s my favourite pick me up for a staff member who seems a bit low. You’ll have to shoo them away, because they’re going to be confused and stand there for a minute, looking at you like you’re coo coo bananas. Rightfully so, but that’s part of the fun. Once they arrive in a private location and open the bag, here’s what they’ll find. You seem like you could use a break. I’ve never had a staff come back without a huge smile on their face. Let’s be real – a surprise break + chocolate… umm… yes please! Just remember that when they get back, you need to do the universal “shhh” signal to remind them that it’s a secret. Feel free to add a wink if you can pull it off without seeming super creepy. There are so many ways to encourage and support each other, but this is by far my favourite. What are some ways you support your staff/ have been supported? Tell me about it in the comment section below. Or the one just before it about Oprah and Cancer. The story I share is with an old camper of mine who is now 25 and facing pancreatic Cancer. Thanks for commenting, lessons from a camp counsellor is actually the post that led me to your blog! I’m so sorry about your camper/ friend, I’ll definitely check out your post about it.